The genus Agave comprises plants that are a source of nutrients for humans and animals and can support their ecosystems. Agave extinction may impact a long list of organisms including plants, pollinators, animals, and soil microorganisms. Agaves have an extraordinary adaptability to arid and semiarid environments. Physiological and morphological strategies allow them to survive under extreme conditions such as drought and high temperature (up to 61 °C). In recent decades it has been discovered that bacterial and fungal communities in plants are not simple passengers, and this is especially true for microbial communities of seeds. 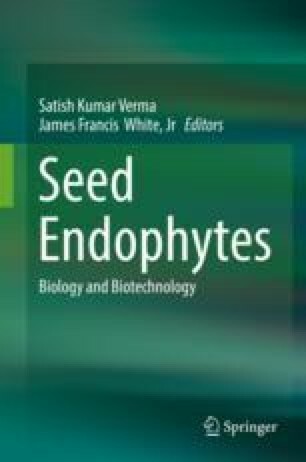 Seed transmission of endophytic microbes appears to be important in shaping the endophyte community in the mature plant and consequently acts as the initial inoculum for the plant microbiota. Those microbes participate in seedling growth, favor intake of nutrients and resistance to abiotic and biotic stress, and, in some extreme cases, can be used as “food” for the plants. The Mexican group gratefully acknowledges the financial support from CONACYT: Proyectos de Desarrollo Cientifico para atender Problemas Nacionales (CONACYT 212875); Project 207400 of Bilateral Cooperation Mexico-Brazil funded by CONACYT and CNPq (Brazil, No. 490440/2013-4); Apoyo al fortalecimiento y desarrollo de la infraestructura científica y tecnológica convocatoria 2016-269607. A.M-R G.M-R and A.H-R thanks CONACYT for PhD fellowships # 720754, #256660 and #414739 respectively. Paolo Di Mascio thanks PFAPESP (Funda. o de Amparo. Pesquisa do Estado de Sao Paulo, No. 2012/12663-1, CEPID Redoxoma No. 2013/07937-8), CNPq (Conselho Nacional para o Desenvolvimento Científico e Tecnológico, No. 301307/2013-0, No. 159068/2014-2). Marisa H.G. Medeiros No. 159068/2014-2), CAPES (Coordenação de Aperfeiçoamento de Pessoal de Nível Superior), PRPUSP (Pro-Reitoria de Pesquisa da Universidade de São Paulo, NAP Redoxoma no. 2011.1.9352.1.8) and John Simon Guggenheim Memorial Foundation (P.D.M. Fellowship) for financial support. James Francis White is also grateful for support from USDA-NIFA Multistate Project W3157 and the New Jersey Agricultural Experiment Station. This book chapter is dedicated to the memory of my wife Dr. Cecilia Vélez-Gutierréz, who recently passed away (15/01/2019). Thank you for your courage, discussions and teachings as well as motivating me to approach agaves as a model for endophyte studies, I will always love you.